Links below are to bookmarks on this page. For our full book-length version of this history, see note at page bottom. Martha Crone’s connection to the Eloise Butler Wildflower Garden and to her assistance in founding The Friends of the Wild Flower Garden are linked back to her innate loving response to wild things and their place in the environment. Like most people who devote a passionate lifetime to the pursuit of a certain subject or hobby, she was largely self-taught about wild plants and birds. Her first contact with the Garden was as an inquisitive and persistent visitor, extracting information from Eloise Butler and in turn bringing in specimens and providing assistance to Eloise. 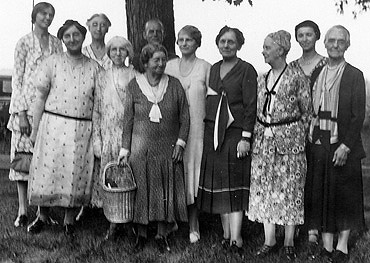 Above: At the left we see a group of friends gathered on August 3, 1931 for Eloise Butler's 80th birthday. Eloise is in the middle with the basket, Martha Crone's husband, William, is directly behind Eloise and Martha is 2nd from the right. Photo - Minn. Historical Society. For identification of all individuals and an additional birthday photo click here. 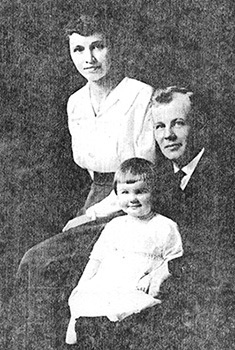 Martha and William Crone with their only daughter Janet, circa 1920. Janet was born June 16, 1917. Photo Martha Hellander. Martha was 39 years old when she became Curator following the death of Eloise Butler in 1933. She recalled that she had spent about 15 years helping out in the Garden which would put the start of her volunteer time around 1918 when she would have been 24 years old - she was born on January 29, 1894. [Conversation with Pat Deweese, The Fringed Gentian™, Winter 1978]. She and her husband William, a dentist, lived at 3723 Lyndale Ave. North in Minneapolis. There was room for a garden in the back yard. They had been married on Sept. 1, 1915. Dr. Crone had his dental office in the house but frequently spent a day doing dental work in small communities outside Minneapolis. Together the Crones were avid explorers of plant habitat and especially mushroom habitat as both with involved with the Minnesota Mycological Society. Martha was secretary of the Minnesota Mycological Society from 1926 onward for a number of years. Considering the need for large numbers of plants for the developing Wildflower Garden, the Crones were able to provide good assistance to Eloise Butler in finding sources for wild plants and for rescuing plants from areas where the native habitat was soon to be overrun with development. Above: Theodore Wirth - Superintendent of the Minneapolis Park System 1904-1935. Photo Minneapolis Parks. An inference may be drawn that since Martha Crone was helping Eloise Butler in the Garden for those 15 years prior to her being appointed temporary curator that the transition was preordained and automatic. That is far from the case. For example: It is evident from a letter written by Eloise Butler to a Mrs. Pearl Frazer in Grand Forks, North Dakota, that Eloise was ready to retire, but was having great difficulty in finding someone to replace her. Mrs. Frazer had been in correspondence with Mr. Wirth about a position in the park system and Mr Wirth, believing she was referring the the Curator position asked Eloise to write to her. Eloise’s reply letter to Mrs. Frazer, at the request of Mr. Wirth, laid out what the job of Curator entailed in a somewhat discouraging manner by explaining the difficulties of the job, but ended by saying “If you and Mr. Wirth come to an agreement, he has suggested that I correspond with you during the winter and inform you more fully of the work.”(1) As this letter was dated Sept. 29, 1932, it is obvious that Eloise was not considering Martha for the job. It’s not that she may not have been recommended for the position by Eloise and others, and it is not that Theodore Wirth was not acquainted with who she was, as the events of 1933 clearly show. It’s most likely that Martha Crone did not want a job that tied her down six days a week for $60 a month, working alone in the vastness of Glenwood Park. Mrs. Frazer ultimately declined interest as she was looking for more of a nature photography position, not full responsibility for a garden. Mrs. Frazer's correspondence about this with Eloise Butler was included in the last letter that Eloise sent to the Crones from her winter home in Massachusetts on Jan 11, 1933. (pdf copy of letter to the Crones) In this Jan. 11th letter the wording Eloise uses may indicate she really wanted Martha to take the job and perhaps wanted to put the proposition to her directly in the Spring: “I want also to thank you especially, Mrs. Crone, for what you wrote about the continuance of the wild garden. There’s too much of truth in what you say, but I will soon be able to talk with you about the matter in detail." On April 11 Martha received a phone call from Clara Leavitt that Eloise had passed away the previous day. The funeral service would be at the Lakewood Cemetery Chapel the next day. On April 23, 1933, following the death of Eloise and the appointment of Martha as temporary Curator, Gertrude S. Cram, longtime friend of Eloise Butler, writes to Martha Crone that “I have heard so much of you from Miss Butler that you seem like an old acquaintance. I am so glad to hear that you are to be in her beloved garden in her stead. - I trust for more than temporarily - for I am sure it is what she would have desired.” (2) The wording about “temporary” indicates what happened. April 13 - "went down to see Theo Wirth. Wirth stated in his April 18 memo to the Board of Park Commissioners that "Mrs. Crone is willing to undertake the work and I wish to recommend that I be authorized to employ her . . ." Did he talk her into it?? April 19: "Bill received call from Theo Wirth for me to be at garden tomorrow". April 20 - "Met Wirth (and others named) at garden, opened office, started taking inventory of everything". May 3 - "Sent letter of acceptance to Wirth". In a memo to the Board of Park Commissioners dated April 18, 1933 (five days after his meeting with Martha) Theodore Wirth writes of his appointment of Martha as temporary curator of the Garden “during the balance of the season, or such other time thereof as seems advisable and satisfactory, the term of employment to be from date to Oct. 1, 1933...pay to be $60 per month.” On May 20th, she met Wirth and his secretary (among others) at the Garden. The Secretary brought time cards. Some days later Martha received a letter from Mr. Wirth’s secretary explaining how and when to complete the time sheets (twice monthly) and who to give them to. The "or such other time as seems advisable" was to last a long time. The $60 per month was the same amount Eloise Butler had been receiving. In her files at the History Center are copies of the notifications to the Park Board from the Minneapolis Civil Service Commission confirming that Martha Crone is eligible for the position of curator on a temporary basis. i.e. the one dated March 28, 1936 confirms her salary as $60 per month. It is only the certification dated April 4, 1940 that lists the position as “permanent” at $100 per month for a six month term. Martha was never a Park Board employee until her appointment as Curator was made permanent. The Curator position was unique within the park system, and very seasonal, and thus, was never “highly paid” in terms of salary. For example, even after becoming a Park Board employee Martha’s net pay after taxes and after a pension deduction was $56.42 for the last half of October, 1946. She was expected to be around every day the Garden was open, which was every day except Wednesdays - that was her day off and the gates were locked. Since Eloise had Saturdays off, Wednesdays must have been the day Martha was allowed to chose under the contract. All documents are in the Martha Crone Collection of papers at the Minnesota Historical Society. Below: Fig. 5 Letter from Gertrude Cram to Martha Crone, April 23, 1933. Mrs. Cram then ends with this comment about Martha: “She (Eloise) said ‘you really should know her; she is a wild flower crank like you’. That tells us both what to expect, doesn’t it?” (2) Martha was well known in the area for her plant collecting efforts. She did what Eloise had done - search the wild for suitable specimens and get permission to retrieve them; rescue them when the habitat was about to be destroyed; receive donations of plants from friends; and plant seeds for new plants. Martha set out large quantities of plants she had grown from seed. Her Garden Logs for the 1950s sometimes run to several hand-written pages of species of seed planted. When she acquired more plants than needed or when dividing was needed, she would send seeds and plants to various friends around the country. For example: The double bloodroots (photo right) (these were still in the Garden in early 2000s) she sent to friends Gladys Mockford in Blackduck, MN and to Mrs. Eldred (Blanch) C. Mather in Green, Iowa in May 1968. She maintained a large wild flower garden at her home and frequently brought in plants from there. 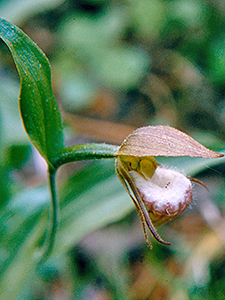 The Crone property at Cedar Creek Forrest produced a large number of marsh plants, such as 24 Ramshead Lady’s-slippers in 1936. (detail on the property given below). Martha's husband, Dr. Wm. 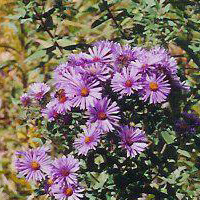 Crone was from the Mankato/New Ulm area and on family visits there they became aware of plants that needed help. In the late 1940s they rescued several Wild Poinsettia plants from a new building site. This rescue was mentioned in a June 10, 1951 Minneapolis Sunday Tribune article by Jane Thomas. In 1939 she obtained 325 Snow Trillium from there in similar circumstances. Here are some of the key Garden events of these years, taken from Martha’s Annual Reports to the Superintendent of Parks (4), her Garden Log and her diary. There is more detail on the linked page - Key Garden Events of the Crone Years. In 1933, Martha completed the planting around the Mallard Pool area that had been started by Eloise Butler in 1932. The early 1930s were years of drought. She writes about the losses of plants, but also her planting efforts to replace species. She remarks on how visitors were becoming acquainted with the Garden as a place to study birds, as the birds were unmolested there and one could see as many as 100 different birds. She gets a new fence in 1938 to surround a good part of the Garden to replace the original run down fence of 1924. 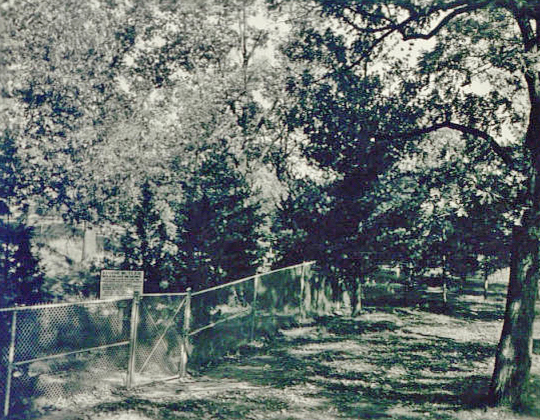 (Garden fencing details 1924-present) Martha had made a plea in her 1937 report to the Board of Park Commissioners about the status of the Fence. In 1939 fencing is placed in the Mallard Pool area. Below: The new fence, reported by the Park Board to be about 1,900, was constructed by workers of the WPA (Works Progress Administration). It was six feet high and of wire mesh, with 3 gates for entrance. As the material lasts for decades, the existing wire mesh fence is presumably the one erected in 1938. The two main gates were been replaced in the 1970s and then in 1990 and 1995 with sturdier and more impressive designs. Photo by Walter B. Dahlberg. At her request, in 1939, the Garden stays open into October so that visitors can see the fall blooms and colors. The Garden always closed on September 30, but this year the close date is moved to October 15th, where it is again today, after having a period from 1947 to 2002 when it closed on October 31st. It is with deep regret that I record the passing of the oldest inhabitant of the Reserve, the Giant White Oak, estimated age 700 years. It had become a hazard to passers-by, therefore it was removed in October. Martha began work immediately in the new addition. Besides doing whatever clearing work was required on the new land, (removing excess trees and sumac for which she had Park Board maintenance assistance) she set out 210 new plants in the area in 1944. These plants were of 30 different kinds that she had collected on four field trips that summer for which she had approved time off from the Garden. In 1945 she set out another 4,000, again from field trip collections and from the assistance of others. In some instances she reports that native soil was also brought in for certain plants. She also completed 2,000 feet of new trails that year. For the next several years she set out new marker labels (250 alone in 1946) that were obtained courtesy of Clinton Odell. Below: Fig.9. Upland Garden May 1948, Photo from a Kodachrome taken by Martha Crone showing some of her new marker labels. Click on photo for larger image. Here are some of the key Garden events of these years, taken from Martha’s Annual Reports to the Board of Park Commissioners. There is more detail on the linked page. Key Garden Events of the Crone Years. 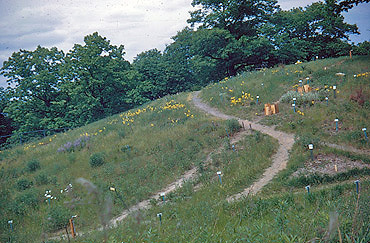 In 1946, a corduroy path was put in by Bill Crone going through the wetland from North to South. Previously there were short stub paths that led to certain parts of the wetland but not a continuous path. In 1947 Martha had three new pools excavated so she could display more aquatic plants in a more sunny location and visitors could now enjoy aquatic plants close up. In 1948 she had them enlarged. These pools in the wetland subsequently silted in and had to excavated several times. 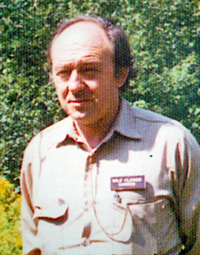 Ken Avery did the first of several excavations in 1961. Eventually, they were left silted in. While the basins of these new pools still remain hidden in the wetland, the remnant of the original small pool at the north end of the Garden is still there, and today, while there can be standing water in the wetland, there is not a large open pool like the Mallard Pool that Eloise Butler created in 1932 in the meadow north of the current Garden North boundary. (Details on that pool - PDF). Other details and photos on the Garden Pools. Fig. 7 above, the wetland area as it looks today - early spring. Photo Friends of the Wild Flower Garden, Inc. Click on image for a larger photo. 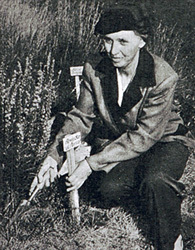 Fig 10 above: Martha Crone inserting a marker for Blazing Star in the new Upland Garden. Photo as published in the Minneapolis Sunday Tribune, May 21, 1950. City water was brought into the Upland Garden via a connection at Chestnut and Xerxes Ave. in 1947 to provide a supplement when rainfall was short. The droughts of the 1930s had been disastrous for a number of plants in the Woodland Garden, and now with the expansion into the Upland Garden, Martha believed that there were just too many special plants to allow the water supply to rely on chancy rainfall in the hot months. The water supply did not reach the Woodland Garden however, until 1964 so hoses had to be strung down to the Woodland Garden when additional water was required. In 1950 Martha introduced the first free Garden Information Brochure. She references the success of these in several reports. In 1952 she brings out an 8 page Self-Conducted Tour brochure and notes that 10,000 were distributed in 1952. (PDF of Brochure) In 1953 there was also available Garden plant lists, which were sold for 10 cents each to visitors. These lists, compiled by her, also included her 4-page 1951 Garden History. [PDF of both] Also in 1948, Martha began to put together a set of color slides of Garden plants that she could use for illustrated lectures about the Garden. She began to give talks in 1951. In 1955 the Garden received a gift of funds from the Minnetonka Garden Club and the Little Minnetonka Garden Club to create a fern glen in an undeveloped back grove of the new Upland Garden. She began this project in 1956 by setting out 2,160 fern plants followed by 308 the next year and ending her part of the project in 1958 when the total reached 2,843 fern plants. 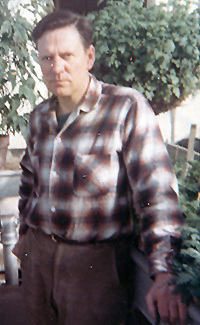 Ken Avery would complete it in 1960-61 with the total plant count at 3,094. In 1956 Martha was awarded a Bronze Medal for achievement in horticulture from the Minnesota State Horticultural Society. The first telephone was installed in the Garden in 1957, following Martha’s request for one in 1951. In 1958, Clinton Odell passed away. Martha purchased a memorial "settee" from the Mankato Stone Company with funds contributed by friends of Clinton Odell. The bench, of native Mankato Dolomite, with memorial plaque, was placed on the central hill of the Upland Garden in 1959. (photos left and below). In addition, there is a pair of benches made of Kasota stone (limestone) dedicated to Clinton Odell, that sit just off the patio area in front of the Martha Crone Visitors Shelter. These were given by his daughter, Moana Odell Beim. Left: Fig. 11. 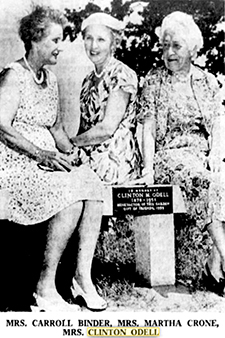 At the dedication of the memorial bench to Clinton Odell, 1959. (Photo: As published in the Minneapolis Tribune. Fig. 12. Dedication plaque on the Odell Bench. Photo: Friends of the Wild Flower Garden. There are additional photos of the memorials for Clinton Odell on the Garden Memorials Page. Snow and ice in the Garden in early April was a frequent occurrence. The little cabin Martha used for an office was unheated and did not have electricity so kerosene lamps, and occasionally a kerosene heater were used, both of which Martha brought from home. In the late 1940s a small wood stove was installed. Even with the various methods of heat, on cold days the office did not get warm and at times she would run up and down the path a few times to warm up! (4a). If you have lived in the metro area for many years you know it is not unusual for winter to delay the Garden’s spring season. That is actually more common than an early spring. Check out these quotes about opening day and the weather from Martha Crone's log and her diary: 1934 to 1958. The only place of protection in the Garden from storms or other adversities was the small office structure in the Woodland Garden that was originally constructed in 1915 for Eloise Butler. A small tool shed that had been moved into the Garden in 1912 was also located nearby the office. Very little was spent on the refurbishment of the office except for adding a wood stove in 1944 and the pergolas and trellis around the outside. It was slowly growing inadequate. 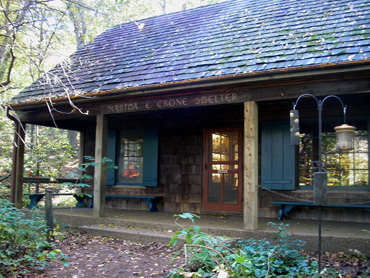 It would be 1970, long after her retirement before it would be replaced by the current Martha Crone Visitors Shelter. Fig. 13 above, the original “office” structure. June 1948 - originally built in the Garden in 1915. Photo - Martha Crone. click on photo for larger image. While Eloise had not been able to secure any paid park staff helpers, she did make use of some local boys for assistance, [including Lloyd Teeuwen who helped her with the Mallard Pool and was present when she died]. Martha had several workers from the Park Board available to her when needed during the late 1940s. There are references in various writings, such as Friends of the Wild Flower Garden President Mrs. Faragher's April 25, 1969 letter that Martha worked virtually alone. (6) But while that may be true prior to 1946, time records in the Crone files indicate that two workmen were usually available for continuous help in the Garden from 1946 through early 1949. Of those known are Clarence Larson, Eddy Subourin, Bjorne Herland and one, Fred Gau, being continuously employed through 1948. Others then and in later years, and with longer terms, included Sam Baker, Ed Bruckelmyer Bob Clark and eventually, Ken Avery. 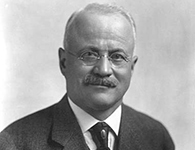 Clinton Odell made donations to the Park Board, beginning in 1945 and for several years thereafter, to partially cover the cost of one workman, while the Park Board paid for the other (6a). There is then a period from May 1949 onward, when she apparently lost continuous help, perhaps due to Park board funding restrictions. She references in her 1953 report how help is really needed and that she had received some additional garden help for 50 days in early summer. Ed Bruckelmyer is in her records in 1948 and 1949 and reappears in 1958. He then worked for Ken Avery until he retired in 1970, at which time Sam Baker, who had also worked for Ken in the early 1960s, reappeared and worked until 1976. Above: Ken Avery. Newspaper photo. "There must be greater support to protect this bit of wild area and keep it in its natural condition. It is really a challenge to keep this Wild Flower Garden since we and the next generation need the beauty of our natural flowers, many of which are disappearing in advance of our civilization." 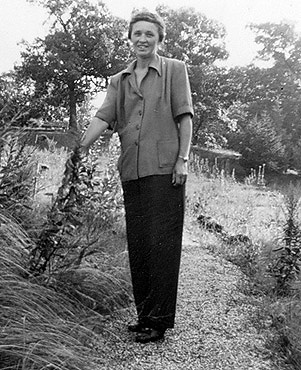 Above: Martha Crone in the Upland Garden, June 1951. Minneapolis Tribune Photo. Note on Native Plant Status: Some of the plants obtained by Eloise Butler in the early years of the Garden were not native to Minnesota or if native, may have been difficult to establish in the Garden. Many of the non-native ones are no longer present. Martha Crone was more selective of native plant material but not all have survived either. Her definition of native was not that it was originally present in the area of the Garden but that it was in the same climatic area and thus could have grown there. She wrote in the Jan. 1954 issue of The Fringed Gentian™ that non-native plants were used "to make the Garden interesting and more attractive to visitors." From the tenure of Ken Avery to the present, plants selected are those that once were present in the Garden area. (Note: By the time Martha wrote her brief History of the Eloise Butler Wild Flower Garden in 1951 her attitude had changed. Easy growing plants and invasives could rapidly spread and shade out more desirable plants. Some control was needed). 1926: The Society displayed 44 varieties of mushrooms at the Minnesota State Fair (the State Fair display would be an annual event for the Group). 1927: A great abundance of Morels. 1927: The Crones gathered 1000 specimens of the deadly Amanita phalloides for the University of Minnesota for experimental purposes. 1933: No morels this season at all. Photo Above: Martha Crone. Photo - Martha Crone Collection, Minn. Historical Society. fig. 15 Above: Ram's Head Lady's-slipper (Cypripedium arietinum). Photo by Martha Crone. 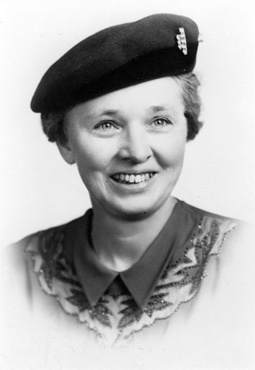 There is an interesting connection between Martha Crone, wild plants and the University of Minnesota. Martha and her husband Dr. William Crone became interested in a parcel of land in Anoka County, in the area of East Bethel, as a source for plant observation and collecting. The area, then known as Cedar Creek Forest, was swamp and bog with upland areas of dense woodland. In her log of plantings at Eloise Butler Wild Flower Garden, this is the area referred to when she writes of plants obtained from "Cedar" or "Cedar Swamp" or "North of Anoka". On July 1, 1936 Martha recorded digging up 24 Ramshead Lady’s-slippers (Cypripedium arietinum) and 3 Ground Junipers (Juniperus communis) and transplanting them in Eloise Butler. The Ramshead’s had 30 blooms the following year, but unfortunately they died in 1938 from excess moisture. On December 31st, 1936, the Crone’s purchased 40 acres of this area for a total price of $375 with $10 down payment. In the middle of this land there was dry upland that resembled an island within the swampland. Here they built a cabin in 1938, carrying the building materials through the swamp to reach the dry land. It was not until 1939 that they finished what could be called a causeway that reached the “island” without getting one’s feet wet. The cabin area became known as “Crone’s Island”. In late summer 1938, the cabin was broken into and all there inside possessions were stolen. The county Sheriff was notified and the Crones proceeded to secure the cabin more tightly and over the next year completed the finishing touches. fig. 16 Above: The area of Cedar Creek containing the original Crone property. 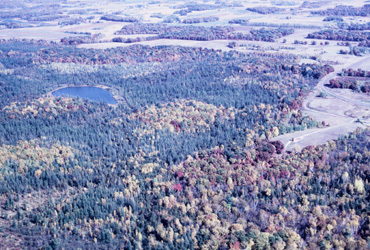 The view is NE across Norris woods, Crone knoll (in the center of the photo), & Cedar Bog Lake just left of center. Photo by Donald Lawrence, 1966, University of Minnesota. This swampy bog area was of great interest to those in the botany profession. The first recorded research interest in the area dates back to 1929 when an aerial survey first disclosed the significance of the habitat. In 1947 a large “Study Area” was outlined by the University of Minnesota - the area included the Crone’s land. The purpose of the Study Area was for students of botany and professionals to be able to observe and study the habitat of a natural swamp and bog. 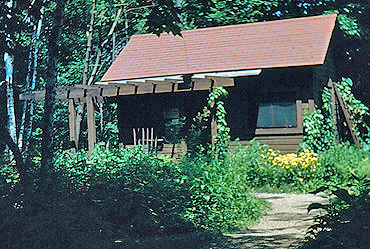 On Sept. 14, 1957 the University of Minnesota dedicated the Cedar Creek Forest Laboratory. Martha was invited to attend. (William had passed away in 1951). Access to the lab area was via the Crone land and that of several other property owners. On May 24, 1961, the University, by letter from University attorney R. Joel Tierney, offered to purchase her land if University funding could be obtained. At that point in time Martha was retired from the position of Curator at Eloise Butler. There is not a record in her papers as to the date of sale but it was sold, presumably within the same year. The Study Area is now known as Cedar Creek Ecosystem Science Reserve with an area of about 2,200 hectares (5,400 acres, or about nine square miles). It is important as a relatively undisturbed area where three biomes meet (tall grass prairie, eastern deciduous forest and boreal coniferous forest), supporting 51 species of mammals and 238 species of birds. It is a nationally and internationally famous research center, recognized as a Registered Natural Landmark in 1975. The land where Martha’s cabin was situated is now known as the Crone Knoll. 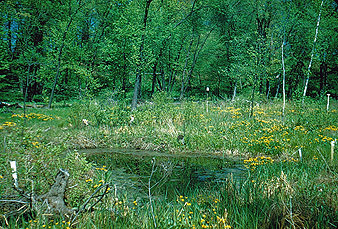 On June 18th 1952 Articles of Incorporation were filled with the State of Minnesota for The Friends of the Wild Flower Garden, Inc., a non-profit group formed for the purposes of educating the public by enhancing appreciation for and understanding of Minnesota's native plants and their natural environments; of safeguarding the integrity of the Eloise Butler Wild Flower Garden; and of aiding in its support with both financial and volunteer assistance. …however much remains to be done and to supplement the Park Board’s efforts, we have started Friends of the Wild Flower Garden, Inc. This non-profit corporation has a perpetual charter. None of its officers can draw any salary, or derive any pecuniary benefit from its operation. Its annual dues range from $3 to $500. Many of our business and professional leaders, also a number from outside our city, have taken up memberships. Martha used the newsletter to provide informative short articles on plants, birds, and the environment. Rarely did she mention what was going on in the Garden that she cared for. You will rarely learn anything about her daily activities and the state of the Garden. She must not have thought that the membership would be interested in that. Future editors would follow a different course. Above: fig. 17. The Martha E. Crone Shelter, constructed 1969-70. Click photo for larger image. From 1948 to 1957 Martha Crone assembled a collection of Kodachrome slides that she took of plants and landscape of the Wild Flower Garden and some plants from other gardens. The assemblage eventually totaled over 4,000 slides. As Secretary of The Friends she used these slides to give illustrated lectures about the Garden to various clubs, groups and organizations, eventually logging over 300 groups. She also reported these educational activities in her annual report to the Board of Park Commissioners and also in her Secretary’s Annual Report to the Friends Board of Directors. After her death in 1989 her daughter Janet, passed the collection to the Friends via Friends member Martha Hellander who was in the process of researching a book about Eloise Butler. The Friends sorted the collection and then for a short time beginning in 1993 used them at lectures about the Garden, then later deposited the collection at the Minnesota Historical Society. Some of those images are shown on these pages. Martha Crone had written about the need for a new building at the Garden that could be used for “housing an office, Museum and Herbarium of specimens.” The herbarium was another of her creations. Martha Hellander’s research indicated there were over 1,000 mounted specimens already by 1937 but they were not ever placed in the new shelter. Hellander indicates they may have gone to the University of Minnesota Herbarium. After 53 years of service to the Garden and the Friends (38 years after being appointed Curator in 1933 and about 15 years of service to Eloise Butler prior to that), she finally retired from all positions except as a director in May 1971, turning her Friends duties over to Mildred Olson. In honor of her long service to both the Garden and The Friends, the new shelter building, constructed and funded by The Friends in 1969 was dedicated to her on May 13, 1970. Above, fig. 18. 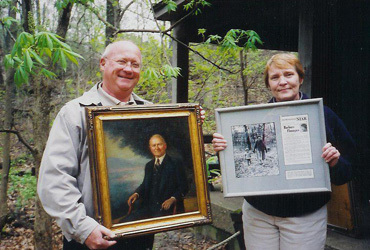 Clinton Odell III, grandson of Clinton Odell and Lynda Wander, granddaughter of Martha Crone, shown here in front of the Martha Crone Visitor Shelter holding images of their grandparents. Mother's Day, May 12, 2002 at the 50th Anniversary Celebration of the Friends of the Wild Flower Garden. Photo - Friends of the Wild Flower Garden. Martha and Bill Crone had one daughter, Janet, born June 16, 1917. Janet only survived Martha by four months. Janet (Prevey) was killed in a car accident in Canada on May 27, hit by drunk driver. Surviving her were two daughters Linda Prevey Wander and Judy Prevey. A son, David had died previously in a car accident at age 17 on December 14, 1962. Judy died in 1995 and Linda in 2010. Linda and husband Nicholas and their family attended the Friends May 2002 50th anniversary event at the Wildflower Garden as illustrated earlier in this article. Martha's summation of her life's work. The following quote is the last that she wrote to members of The Friends of the Wild Flower Garden. "Once again the awaking of Spring, coming after a long time of waiting. How fortunate to have this lovely Reserve to enjoy where Springtime’s beauty unfolds in every flower. Flowers are eager to answer the call of the warming sun, even while patches of snow remain. They must make the most of the sunlight before the forest deepens and veils the woodland. How delightful to hear the first songs of the returning birds. Wildflower and bird sanctuaries that have been established will greatly benefit future generations. How fortunate that this native area was added while still in it’s unspoiled state. "As a young birdwatcher, I became acquainted with the Garden and Mrs. Crone while I was in the eighth and ninth grades in 1946 and 1947. At first I would walk from our home at 14th and Girard Avenues North to the Theodore Wirth golf course and explore the hills, woods and Bassett’s Creek. At the same time I started going to the Science Museum on the fourth floor of the old downtown public library. There, in case after case, were all the mounted bird specimens. I started going on nature field trips led from there by the museum director, Milton D. Thompson. It was at this time that I became acquainted with Eloise Butler Wildflower Garden. Here Thompson would introduce Mrs. Crone to us, and she would give us an update as to what was occurring in the Garden, plant-wise and bird-wise. Mrs. Crone seemed so approachable that in my following high school years, while birding by myself in the Garden, I felt bold enough to knock on her cottage door. That was a brown, vine-covered wooden house, or what I called a shack. She could always tell me what birds were in the Garden that day. One autumn day in the Garden, I remember her telling me where to look for a Winter Wren. I went to that spot, and sure enough, it was still there. That was my first look at a Winter Wren. Mrs. Crone always seemed to be wearing a green woolly beret, or as Hellander in The Wild Gardener calls it, a tam-o'-shanter. And always she seemed to be wearing a green or brown slacks outfit. The first time I saw her in a dress was at the Science Museum, where I would attend the Minneapolis Bird Club evening meetings. During the winter months she worked there as the night overseer -- the same job I was to have several years later while attending the University. In those early years of my teaching career, I had great plans to grow some ginseng as a money crop on a wooded plot up north. So, I asked Mrs. Crone where I could buy some. She said I didn’t need to buy it and proceeded to dig up a clump for me, then added a goldenseal plant for good measure. After school at West High, in the mid to late ‘30s, Robert would ride out to the Garden on his bike to talk to Martha Crone, early in her tenure as gardener. The Dassetts both loved the woods and wild places, and Robert had some pals who were very fond of the Garden, too. He liked to remember his friend Whitney Eastman, “a real bird man” and a great baseball fan during the Millers’ era. Whitney had his own version of a double-header, Robert recalled; he’d watch the first game, bike to the Garden to eat his sandwich and talk to Martha, and then bike back to see most of the second game. Martha Crone Papers and Friends of the Wild Flower Garden Papers, Minnesota Historical Society Collections. The historical color photos from Kodachromes taken by Martha Crone are from her collection of slides that was given to the Friends by her daughter Janet, following Martha's death. 1. Letter, Eloise Butler to Mrs. Frazer, Sept. 29.1932. Pearl Frazer was the daughter of Fanny Heath of North Dakota. 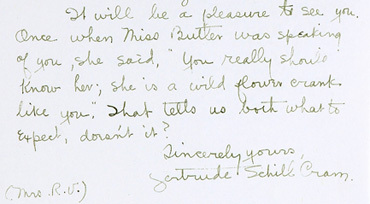 Mrs. Heath was a wildflower expert and correspondence friend of Eloise Butler. See The Wild Gardener, by Martha Hellander, pgs. 94ff. 2. Letter April 23, 1933, from Gertrude Cram to Martha Crone. 3. Letter from Eloise Butler to Martha Crone 3 November 1925. 4. Annual Report of the Garden Curator to the Superintendent of Parks (until 1945) thereafter to The Board of Park Commissioners. Martha Crone Collection. Minnesota Historical Society. 4a. The Fringed Gentian™, Winter 1978, Vol. 26 No. 1. 6. Letter of Catherine Faragher, President of the Friends, to the Membership April 25, 1969. 6a. Letters between Clinton Odell and Superintendent C. A. Bossen, 1945, 1946, 1947, in the Martha Crone Collection, Minnesota Historical Society. 8. Letter to Theodore Wirth, June 22, 1933. Martha Crone Collection. Minnesota Historical Society. 8a. Annual Report to Parks Superintendent Theodore Wirth dated Nov. 19, 1933. 9. Papers and Newsletters of the Minnesota Mycological Society in the Martha Crone Collection. Minnesota Historical Society. 10. Papers and Newsletters of the Minneapolis Science Museum Society in the Martha Crone Collection. Minnesota Historical Society. 14. Martha Crone's diary 1943. ©2019 Friends of the Wild Flower Garden, Inc. Text and research by Gary Bebeau. Contemporary photos by G D Bebeau.